Welcome to our Janka hardness scale for bamboo and eucalyptus flooring page. Here we will present to you our hardwood flooring hardness guide—let’s begin. Strand woven bamboo and eucalyptus flooring, on average, have Janka ratings upwards of 3,800, which is much higher than traditional wood flooring. 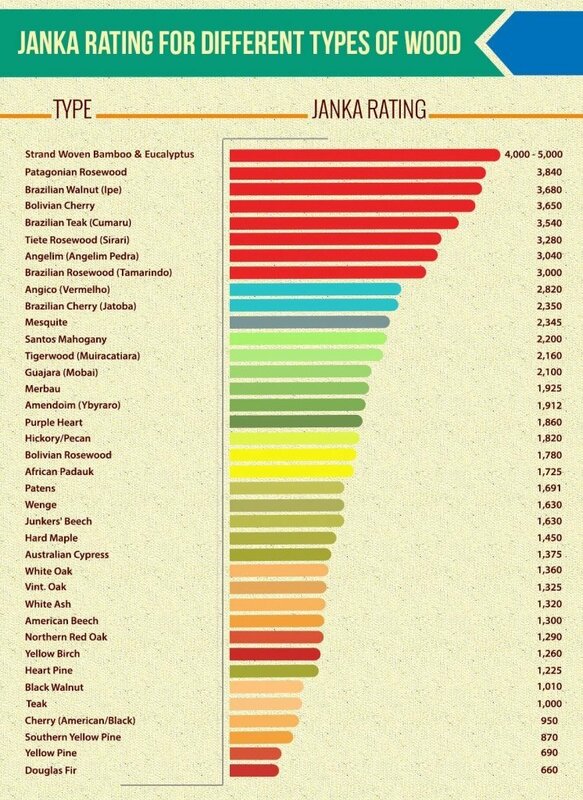 Although some tests have shown bamboo and eucalyptus to be over 5,000 on the Janka scale, the truth is that Janka hardness ratings can vary from lot to lot (even when produced by the same factory). Depending on which time of the year the floor is harvested and the material density and compression rate, and where on the plank the test was conducted (for example the knots/nodes are always harder than the surrounding area), the Janka rating can vary widely. The great majority of strand woven bamboo and eucalyptus lots tend to be in the 3,000-4,000 Janka range. 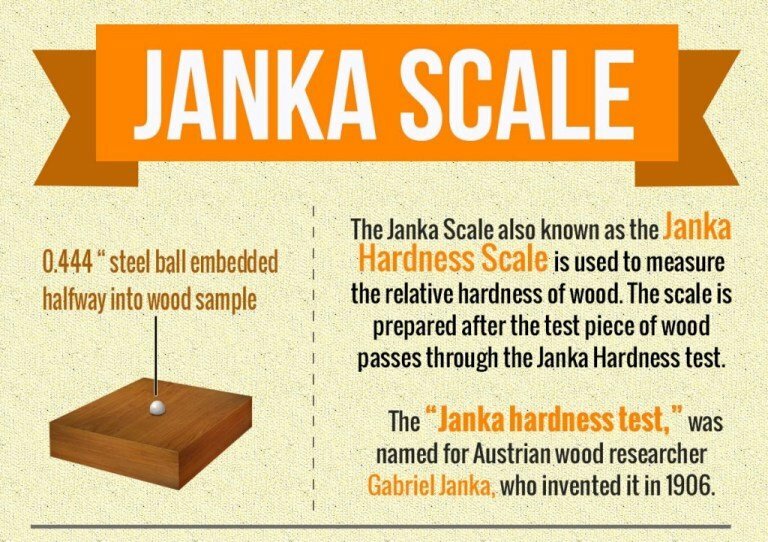 The Janka hardness scale (often referred to as the Janka hardness list) is an industry wide measurement of the hardness of wood. The test measures the amount of force required to embed a .444-inch steel ball to half its diameter into a material. The more force required to embed the steel ball, the harder the material is. For hardwood flooring the test usually requires a 2" x 6" sample with a thickness of at least 6-8mm, and the most commonly used test is the ASTM D1037. 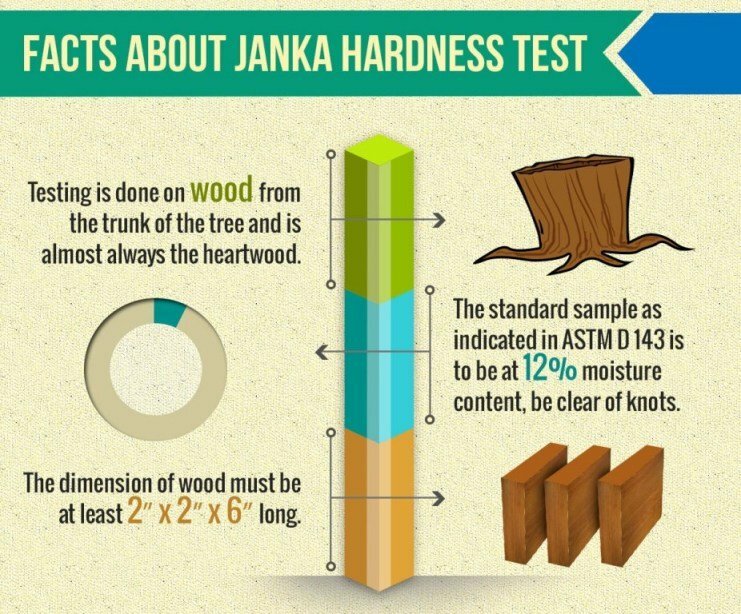 When testing wood in lumber form the Janka test is always carried out on wood from the trunk of the tree (known as the heartwood) and the standard sample (according to ASTM D143) is at 12% moisture content and clear of knots. The Janka score not only provides an indicator of how hard and durable a material is but also how hard it is to saw, mill and nail. In the image below featuring different types of wood, you can see that strand woven bamboo and eucalyptus are at the top of the list with a Janka rating of 4000 to 5000. Why is stranded bamboo flooring so hard? The unique procedure used to create strand flooring involves tearing the strands of bamboo apart and then fusing them together using intense heat and pressure. The way in which the bamboo is laid has an effect on how hard and durable the flooring is. For example, stranded bamboo flooring is made from bamboo stands that have been laid in a cross direction and is therefore more durable than your average bamboo flooring that has been laid straight. 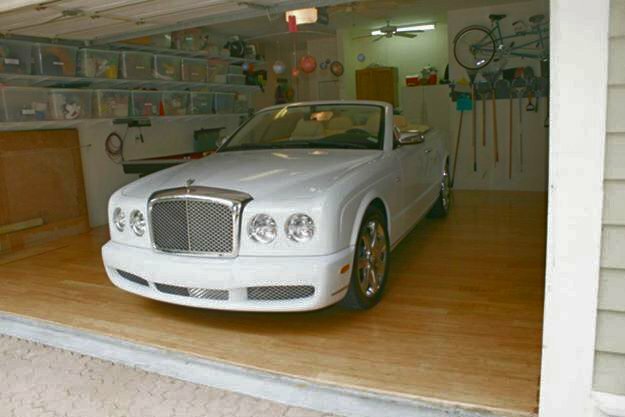 Ambient's Strand Woven Natural Bamboo Floor used in a garage in Florida! As you can imagine, the hardness of bamboo flooring is very beneficial, as it makes it both hard wearing and long lasting. It is the hardest natural material available for wood flooring and provides an affordable and eco-friendly alternative to hardwood. This is great for homeowners with active lifestyles, pets, and children. Another advantage to the hardness is that strand woven floors won’t look dented up in 10 years and you’ll likely never need to refinish them under normal traffic conditions. Not only is strand woven bamboo flooring incredibly hard wearing, but also aesthetically pleasing. Like hardwood, it can come in a number of different tones and with the bamboo strands being completely unique they create a lovely, random marbled grain. Whether you are looking to bring a little of the outdoors inside or give your home a more modern look, strand woven bamboo flooring gives you a lot of options when it comes to styles and colors. As well as being beautiful and tough, bamboo flooring is installed and maintained exactly like traditional hardwood floors. While the hardness benefits of strand bamboo flooring, demonstrated on the bamboo flooring hardness scale, make it a practical choice for your home or workplace, you must take care when choosing a brand. Problems can arise if the density and moisture content in the strand compression process is not managed carefully. You have to keep in mind that for a flooring topcoat finish to be stable, it must permeate the wood in order to hold a lasting bond. If the underlying material is too dense, the topcoat layer may not be absorbed by the wood fully and this may cause a number of problems down the line. Another common problem with high density woods is, if manufactured incorrectly they may expand and contract more leading to shrinkage problems. Choosing the right brand of bamboo flooring will save you from these types of issues, and from having to pay a high cost for repairs later, so make sure to do your homework when choosing your next floor. The ASTM D143 Janka test referenced below is typically preformed on lumber. The common test for flooring is the Janka ASTM D1067 test, which is similar but uses flooring samples. 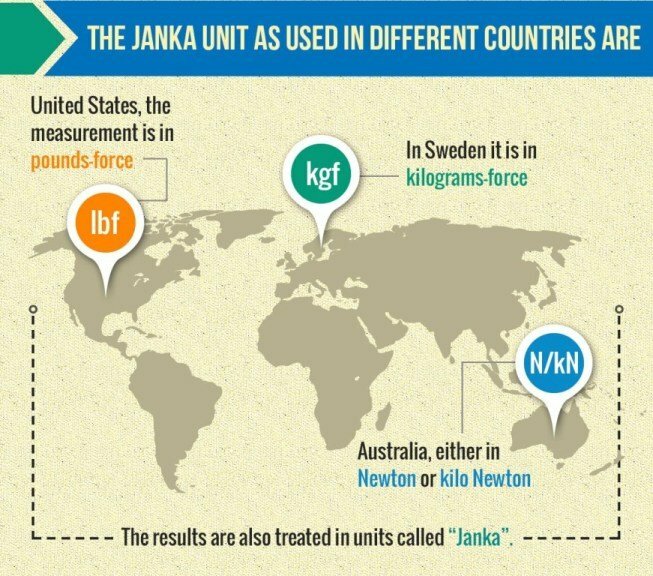 People all over the world using the Janka hardness test, however the units they measure in differ from one country to the next. Whilst here in the US we measure in pounds-force, in Australia they measure in Newton or Kilo Newton. Some results are also treated in units aptly named Janka. For more information about our hardwood flooring hardness guide or the Janka hardness scale for bamboo and eucalyptus flooring, feel free to contact a member of the Ambient team at (866) 710-7070 or by using the live chat widget on our website.